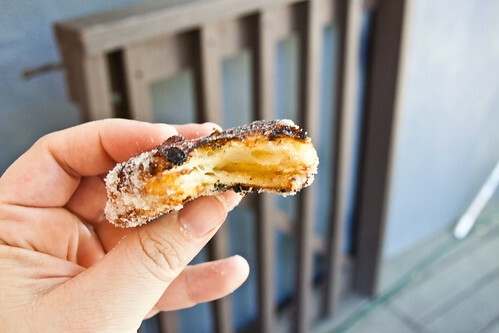 Have you heard about Cronuts? The creation of New York baker Dominique Ansel, they’re donuts made from croissant dough. And people are waiting in line for hours to get one, or buying them from scalpers for $40 apiece. I admit to being curious. Not so curious I’m going to fly to New York and wait in line for hours, or even head to one of the 3 or 4 bakeries in LA that are selling their versions. I’m also not so curious that I’m going to make croissant dough from scratch. I have a 13 month old. In the time it would take me to laminate dough, my house would probably be burned down around me. Or at least all the dog food would be eaten. And not by the dogs. HOWEVER, Trader Joe’s makes pretty darn good bake at home croissants. Have you tried them? They’re little frozen nuggets that you let rise overnight and then they bake into – maybe not the best croissants by Parisian standards, but some of the better croissants I’ve had in the US. My brainy idea was to proof these babies and then fry instead of bake. How hard could it be? I could make cronuts at home! I had visions of a $40 pastry empire. For my experiment, I picked up a box of the mini regular croissants and a box of the almond croissants, since it seems like some cronut reports indicate a sweetened dough. Let them rise overnight. I was tempted to bake them — mmm, almond croissants — but perservered in the name of science. I don’t have a deep fryer, so I shallow fried them (this may have been a tactical error – they were pretty puffy) in rice bran oil, which is pretty flavorless and has a high smoke point. (Ansel fries them in grapeseed oil.) 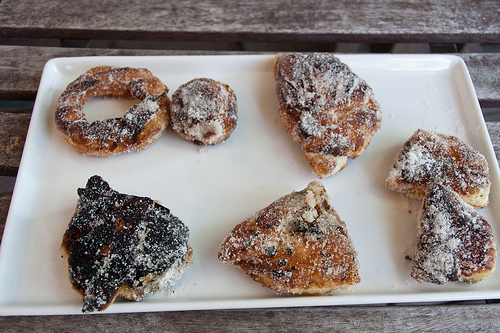 I found that the smaller pieces (I cut some into doughnut shapes, and some into just quarters) fried more evenly, and the almond croissants tended to burn. It was tough in general to cook them enough to get the middle done before the crust burned. You can see some of my more spectacular failures here. When they came out, I rolled them in sugar. I didn’t want to mess with glazes. The result? Very sweet, and VERY rich. I mean, it’s a given right – dough that is laminated in butter and then deep fried is going to be rich. The sugar was plenty sweet too – I can’t imagine them with glaze and filling. The plain croissants were more successful than the almond, which were too sweet and, as I mentioned above, tended to burn. Do they look like the cronut? Not really. 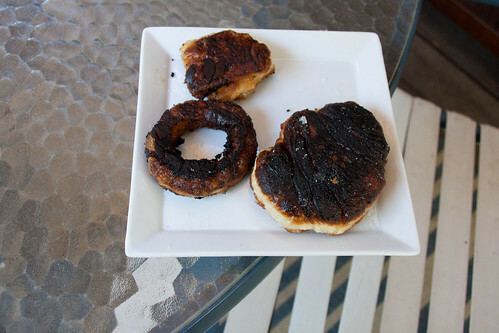 Mine had fewer layers than the cronuts pictured on Ansel’s website. (For the record, Ansel says he uses a laminated dough that is similar to but not the same as croissant dough). On the other hand, mine were done in less than an hour, where real cronuts take 3 days (or 3 hours in line). Were they tasty? Yes, but not really something I’d make again. I prefer my croissants as croissants. – the great textural contrast between the flaky exterior and chewy soft interior was completely overshadowed by oil and sugar. I also recognized that I’m not generally a fan of fried, butter laden dough, so I won’t be lining up next time I’m in NYC. I hear they make a great Kouign Amann, though, and that’s something I can always get behind. LOL! Hey, it never hurts to try, right? :-)Kudos to Ansel for his success but I would never wait in line that long either. Maybe they should combine it with something else – like, get your drivers license renewed and get a cronut! Hilarious! I’m going to nyc tonight and really want to get one…but hours in line? No way! I’ve heard the Kouign Amanns there are really good, which is also sweet and buttery and you can saunter in around 11 (no line!) and pick one up. I think crescent dough might actually be better, since it’s not as rich as croissant dough. A few girlfriends of mine are hot to trot on this idea, and I keep telling them I’m not sold yet because a) I’ve not tried one and b) no one is actually talking about them that isn’t online. Meaning, none of my foodie friends in ANY state has talked about them, unless randomly prompted by something they saw online. Hilarious! I do like the Trader Joe’s idea, as the from-scratch recipes I’ve seen online call for substantially more work, and ain’t nobody got time for that. I tried a version at a bakery up here (no line! ), and it was actually very good, although quite rich. I tried both a regular and pastry cream-filled version, and the filled one was just too heavy. The regular one, rolled in cinnamon sugar, was delicious, sort of a wonderful mix of crispy fried layers with doughy softness.